There is no place like home for the holidays; but there is something magical about starting new yuletide traditions amongst sweet southern charm to get the whole family into the holiday spirit. Whether you have been naughty or nice this year, get away from the hustle and bustle to enjoy the splendors of the season surrounded by the winter tide of Lake Lure and the Blue Ridge Foothills. From the indulgence of Thanksgiving and stunning foliage, to gift shopping and early Christmas festivities, the most wonderful time of year will be celebrated across the postcard-perfect small towns of Rutherford County. The Rutherford County Farmer’s Market will begin to host their next monthly winter market on December 15th from 9:00 am to noon in Rutherfordton Town Hall. With a bevy of fresh, local produce, meats, dairy, and baked goods available at an indoor venue, it’s the perfect one-stop-shop to stock up on all of your holiday necessities. 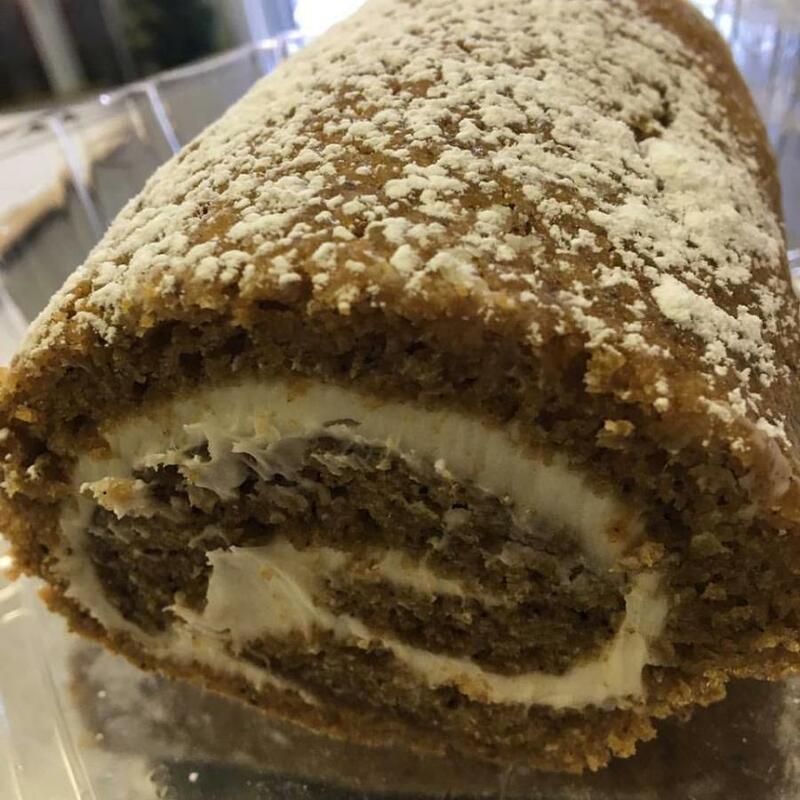 The Whistle Stop Bakery in downtown Bostic will delight the senses and feed the souls with their most popular treat, Pumpkin Rolls! Win your guests over with this pumpkin spice cake brimming with a citrus cream cheese filling. You can also pre-order loaves of sweet breads, or choose from a large variety of homemade cupcakes, mini cheesecakes and pies to complete your holiday spread. Local Farms speckled across the county are open during the holiday season offering an array of fall produce and pasture-raised meats. Visit the family-owned farmers of A Way of Life, Tony’s Produce and Vandele Farms on Cedar Creek to get the best in homegrown products for your special guests. Plus, Blue Ridge Design Gift Shop in Rutherfordton is carrying Longhorn beef, raised on their Maple Creek Farm, and sold from their storefront establishment located on Washington Street. Rumbling Bald Resort, nestled on the north shore of Lake Lure, hosts their annual Thanksgiving Dinner special on November 22nd from 11:00 a.m. to 3:00 p.m. Gather around the tables and let them cook a three-course meal: including turkey, ham and salmon with all of the yummy traditional fixings and selections of pies. Reservations are encouraged, but not required. The Esmeralda Inn & Restaurant is prepared to provide the comforts of southern hospitality amidst rustic elegance for you and your family this Thanksgiving.. Savor in the fresh offerings off the plated menu while amongst the natural ambiance of Chimney Rock on November 22nd from 11:00 a.m. - 5:00 p.m. Create your own feast with a variety of favorites: including ham, turkey, stuffing and casseroles, cranberry sauce and homemade pies. Go local over the Thanksgiving weekend and think outside of the big box on #SmallBusinessSaturday. Treat yourself to the genuine friendliness of our quintessential towns and check off everyone on your list by #shoppinglocal on November 24, 2018. From boutiques and galleries to one-of-a-kind gifts and items for your home, supporting the small business owners across our communities will feel pretty merry and bright this holiday season. Wander through the Main Street stores in the downtowns of Forest City, Spindale, Rutherfordton and Chimney Rock Village or venture off the grid to discover unique goodies, perfect for that special someone. Forest City Merchants Association is going all out for #SmallBusinessSaturday, as they will be handing out free bags to visitors for their shopping excursion in town, plus you can listen to free music and enjoy lunch specials from the various restaurants. Art at the VAC is hosting their annual Holiday Boutique in downtown Rutherfordton. A haven for artists and lovers of art alike will enjoy browsing through the collections of artwork and handmade creations designed by local artisans and crafters. Beautiful pieces from their home studios are displayed for all to view and purchase during their extended holiday operations. November 16th - December 30th. Cherry Mountain Farm and Chestnut Forge Marketplace will be offering extended hours for tours of their farmstead and specials in the gift shop following Thanksgiving. Come learn about Angora goats and the beautiful Mohair they produce. Check out the new fiber studio and take a peek at the recently acquired store items, made only in NC; such as Alpaca socks and goat milk soap, plus special made to order gift sets for the coffee lover. Farm tours are $5/adult and free for children 12 and under. And the shop is open throughout the day. 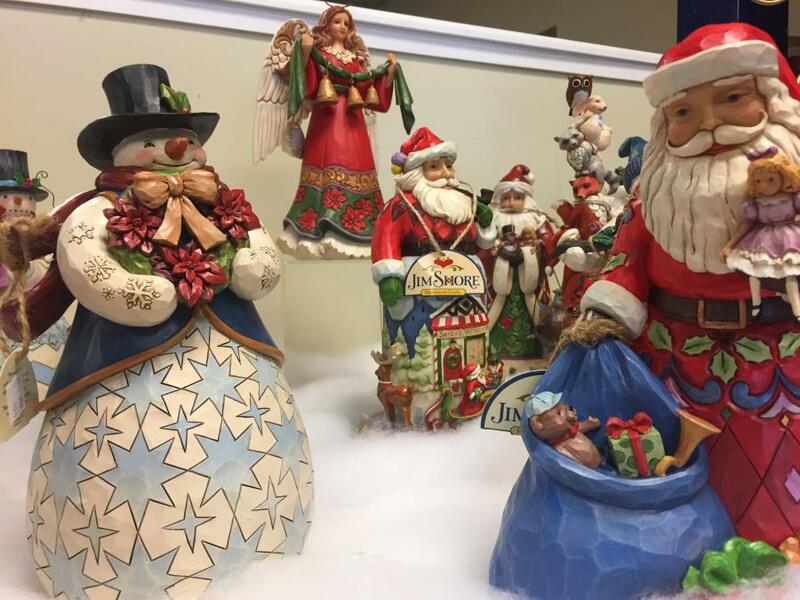 November 23rd & 24th, 10 a.m. and 3 p.m.
Gardenwoods home decor, gifts and greenhouse is hosting a Christmas open house the week of Thanksgiving. Visit their Greenhill store just outside of Rutherfordton to peruse high quality products, culinary items, plant sales and holiday gifts for everyone on your list. And while you are there, try a specialty lunch plate serving up turkey and ham sandwiches. Open Tuesday - Saturday, 9-5 and Sunday 10-3. Throughout the weekend of Thanksgiving and into the early weeks of December, joyous celebrations and traditions will add a little sparkle and cheer to your holiday season. Step into a magical wonderland where good times will be had by all. 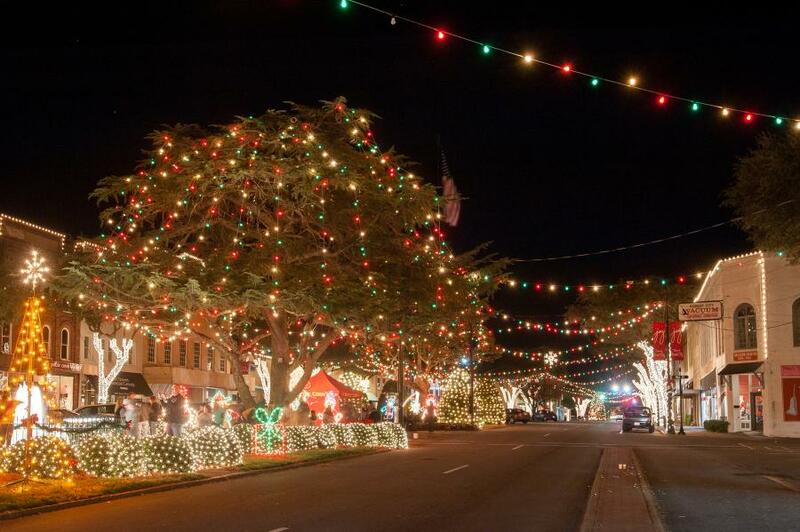 A Canopy of A Million Lights will shine bright on Thanksgiving night as downtown Forest City kicks off the spirit of Christmas with their lighting extravaganza followed by a Christmas parade on Sunday, November 25th. Then, each weekend throughout December families and loved ones will enjoy carriage and hayrides, Santa visits, ice skating, music and hot chocolate. November 30th - December 22nd. Bechtler House Christmas Open House will host a German Christmas Celebration featuring a live band performing German Christmas music, cookies and punch with the house decorated for the holiday season for all to tour. Plus, throughout the afternoon guests can view special exhibits including the Norman Jenkins Bechtler Coin Collection and the Tim Callahan Collection of Bechtler Knives. This is a free event open the public. December 1, 2pm - 7pm. 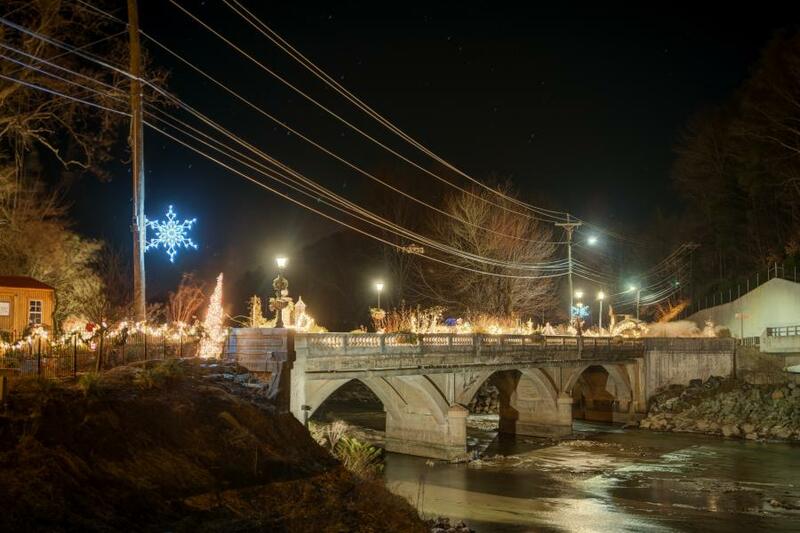 A Small Town Christmas in the Town of Rutherfordton will host a garland of holiday activities for family and friends starting with Pictures and Candy Canes with Santa in Main Street Park and a Holiday Market held at the Shoppes Under Main. 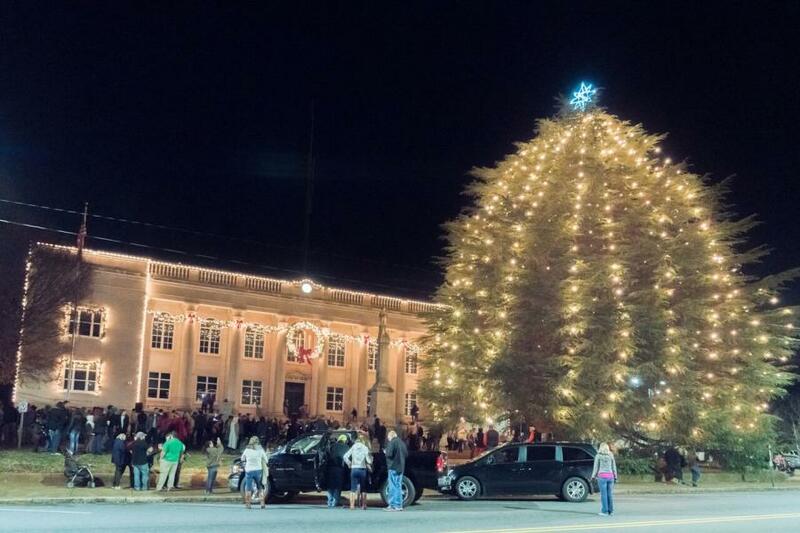 The afternoon continues with the Rutherfordton-Spindale Christmas Parade followed by the lighting of the largest living Cedar Christmas tree, live music, caroling and local snacks and hot chocolate. December 1, 11am - 8pm. 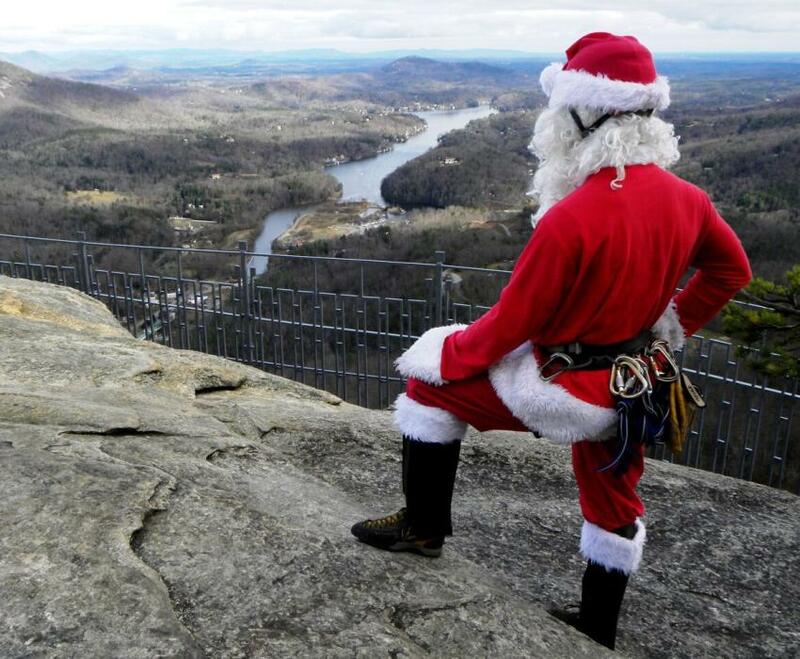 Santa will propel down the world’s largest natural chimney at Chimney Rock State Park. Don’t miss this amazing holiday stunt as St. Nick practices his skills to bring toys to little girls and boys. Plus, enjoy a guided hike with Santa’s Elves in the Great Woodland Adventure. Then, head down the mountain to stroll through the Chimney Rock Village to shop for gifts, visit with Santa Claus and receive stocking stuffers for the kids from local merchants. December 1st & 8th. The Lake Lure Flowering Bridge is an enchanting experience unlike anywhere else in North Carolina. Take a walk amidst the crisp mountain air through a Christmas fairy tale sparkling with white lights, miniature holiday village scenes, and whimsical creations of local artwork, all nestled alongside winter greenery. November 23rd - December 31st. 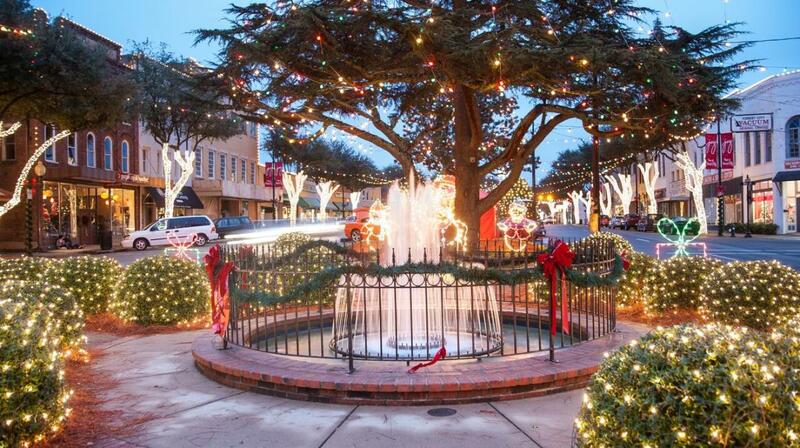 For a holiday map of all the activities and even more information on events around the county, download our guide to spending Christmas in Carolina.